So begins a quest to build the perfect bicycle, a dream machine from a made-to-measure frame, using the finest (rather than the most expensive or lightest) components, a bike tuned to his specific needs, whims and riding style. This is a man on a quest to build his dream bespoke cycle, by way of getting a book deal at the same time (a win-win quest as far as I’m concerned). This is a man who is spending his life and money on a love of bikes – or a mid-life crisis, depending on your perspective. Taking a chapter per component – frame, wheels, handlebars, gearing, and so on – Penn takes us on a tour through what remains of the high-quality, hand-made bicycle industry in a world that has come to accept built-in obsolescence and worships at the altar of low price at all costs. Starting with one of the few remaining artisan frame-builders left in the UK, he gets measured up for his bespoke steel frame, eschewing the modern, fashionable choice of carbon fibre for the simple reason that a steel frame will last longer and can be repaired anywhere he takes his bike. It is a frame that should last for at least 30 years, well beyond the point where all the other components have had to be replaced. It is heart-warming to learn that such skilled people remain, and even more so when you find that Penn chooses a British-made saddle as well; a Brooks leather offering, made by a company that has been manufacturing in Birmingham for over 100 years. If you get nothing else from this book, the joy of learning that some things are still made in this country – and made to world-class standards – is heartening to say the least. From here, Penn’s odyssey takes him through Italy and around the United States (including a visit paid to the dirt track where mountain biking began), in a bid to find the best kit for his new bike, a trip that might be taken as self-indulgent were it not for his wonderful asides and detours that give us a fascinating potted history of the bicycle. Each new component comes with an explanation of the importance of the impact it had on cycling; rubber tyres made the bike into an inexpensive and practical form of mass transportation, for instance, while the introduction of a chain-drive and gearing meant the two wheels could be the same size, making cycles much safer and more efficient to ride. We take the modern bicycle so much for granted in its modern form that it is easy to forget that bikes weren’t always built in this way, and to be reminded of this and learn of the impact they had on history – pretty much everything from women’s lib to creating the first sporting celebrities to the economic development of the West Midlands, according to Penn – is absorbing. For most of us, a bike is important because it gives us our first taste of geographical freedom and speed as children, but the impact of this humble machine – the world’s most popular form of transportation – goes far beyond this. While there are undoubtedly moments where Penn’s inner cycling geek takes over and pedals along at full tilt (which I generally skipped over), there is plenty that this book can offer to the leisure cyclist, lapsed cyclist, traveller, history fan or more general reader wanting to pick up something a bit different – as well as people as keen as Penn himself. It is brimming with enthusiasm, packed with facts and clearly articulated. A relatively short read at 199 pages, it nonetheless leaves you coming away with a whole new appreciation for the bicycle. It is a celebration of craftsmanship over technology, and a pleasure to read, even as you marvel that someone would spend over £4000 and travel over 11,000 miles for the sake of a bike. But hey, it is from such oddities that quest books are formed, and I’ve certainly read about men (and it is invariably men) doing odder things to make a few quid out of writing about their unique experiences. 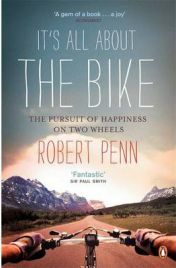 I did enjoy reading this book (and viewing the associated BBC documentary about it, “the ride of my life”) and it did get me thinking more about my bike. I am not a serious cyclist, but I do enjoy commuting on it (when it isn’t raining) and enjoy the sense of freedom it brings – especially on those days when I am at home and Other Half is out with the car. Of course, there is one significant effect to reading this book: you will never look at your own off-the-peg bike in quite the same way again. This can be both a good thing – a greater appreciation of the technological marvel and beacon of efficient engineering you are riding – but it will also produce a hankering for something a bit more personal. And expensive. No Comments on "It’s All About the Bike: The Pursuit of Happiness on Two Wheels"